Location, Location, Location. Not only real estate tycoons live by that mantra. Those of you in the travel industry appreciate it too — especially ecommerce travel agencies who cater to folks from just about anywhere willing to pay with credit cards to go somewhere else. Of course, the travel industry is quite broad and multi-faceted. Ecommerce travel agencies are one key player. Industry brethren include online travel booking sites for hotel reservations, airline bookings, vacation home rentals, and timeshare bookings. Online travel agencies sometimes offer all-of-the-above choices to customers who reside anyplace at all with online access — allowing them to showcase clients both domestic and international. As many other types of high risk ecommerce merchants learned the hard way, travel agency merchant accounts can be hard to come by. Why is that so? It’s because many banks see “travel” as high risk. They’re skeptical about partnering with agencies because most of the transactions occur long before delivery to the customer of actual products or services — akin to a prepay phone service on steroids. Which leaves the agencies open to chargebacks and other costly payment disputes. (Historical data shows that the travel industry experiences one of the highest chargeback rates, averaging 0.5%). And that discourages many merchant services providers from offering travel agency merchant accounts. Yet planning ahead and taking certain steps can help land one — for both new and existing agencies. Read on to learn about some of the special considerations for payments processing most travel industry merchants experience, and how they can tap into their own travel agency merchant accounts. What’s This “High Risk Business” Stuff About? For one thing, you may hear “no” more often than “yes” when seeking the holy grail of travel agency merchant accounts for new or existing agencies. Certain industries carry more risk for banks and other processors. You may not like being lumped in with other high-risk businesses (adult sites, online dating merchants, occult services, and others). But the fact is that banks and other processors, who might provide travel agency merchant accounts, will shy away to protect their businesses. Merchants’ personal records also play a role. Lack of financial processing history, poor personal credit, and an inability to accurately forecast sales among them. Traditional merchant account providers recoil from offering travel agency merchant accounts. Which can put a strain on your ability to start a new travel industry business. 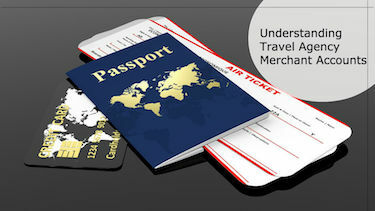 After all, you need the ability to process payment card transactions in order to have a viable ecommerce travel agency. These businesses involve high-ticket, high-volume sales conducted in a card-not-present (CNP) environment — often the preferred bailiwick of fraudsters (whether perpetrators of criminal or friendly fraud). Expect to experience extra scrutiny from payments providers before and after start-up. They’ll scrutinize your business diligently — to check that the risk management procedures planned and implemented sufficiently minimize fraud, customer disputes, and chargebacks. Ecommerce travel agencies must deal with certain types of business transactions in order to make a name for their businesses — and to turn a profit. Many hinge on the need to support local and international clients — what the ecommerce travel industry is all about. These special considerations dictate the types of payment processing capabilities required, and help define your ideal partner when you’re looking for travel agency merchant accounts. High-ticket sales (think luxury vacations for exclusive clients and large group tours) require a high transaction volume account. The ability to process ACH transactions, and all major brands of credit and debit card payments — via a Payment Card Industry Data Security Standard (PCI-DSS) Level 1 compliant, secure payment gateway. Choose a payments processor with an online gateway that supports multi-currency transactions, to allow your business to tap into international markets (now or in the future). That payment gateway should also include fraud protection and screening tools like Address Verification Service (AVS) and IP Address verification to help protect merchants and processors. Both domestic and international merchant accounts (arranged through solid business relationships with worldwide banking partners) facilitate a global customer base. The good news is: Processors who specialize in high-risk travel agency merchants exist. And they’re willing to help travel industry newcomers and veterans find travel agency merchant accounts. Seek one who’s expert in the payments industry, with a long record of success. In addition to the payment processing capabilities highlighted above, look for a processor who wants to work with you as a business partner, and who will treat you like one. Find someone who works also with merchants as a payments consultant — with the capability to ensure your fraud protection and risk management practices are up to snuff. When the inevitable chargebacks occur, they’ll stick around to work with you. They’ll help you put an appropriate chargeback management system in place. Because business partners are in it together for the long haul — no matter where the travel industry takes you.